Wheelchair and scooter ramps are a vital necessity for mobility both indoors and outdoors, and selecting the appropriate wheelchair ramp is important to ensure usability and safety. There are several types of wheelchair ramps available, and many considerations to keep in mind before you select a wheelchair or scooter ramp to purchase. This buying guide provides information on the various types of wheelchair ramps, the key specifications to consider when making a purchase, and recommendation for installation and use of a wheelchair or scooter ramp. First, keep in mind that there are several different types of wheelchair ramps. Identify the type of ramp that is most appropriate for your need. Threshold Wheelchair Ramps: Threshold ramps are the most commonly used ramps. They help to get past slightly raised landings or doorway thresholds. 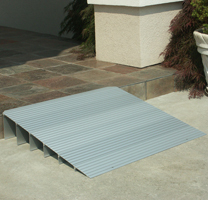 Threshold wheelchair ramps are typically made of aluminum or rubber, and can be moved as needed. The advantage of rubber threshold ramps is that they can be trimmed or notched for a custom fit. Suitcase Wheelchair Ramps: Suitcase ramps are typically used to pass over curbs, stairs, or for vehicle access. Suitcase wheelchair ramps can be folded for portability, but are very sturdy when unfolded for use. Solid Wheelchair Ramps: Solid ramps are typically heavy duty ramps made of one solid piece, and typically stay in place, though they can be moved as needed. Solid wheelchair ramps are ideal for access to buildings that may have steps. These ramps may also have handrails available. Material: Wheelchair and scooter ramps are made of a variety of different materials, including aluminum, rubber, steel and wood. The material you select will depend on the location and portability requirements for the ramp. 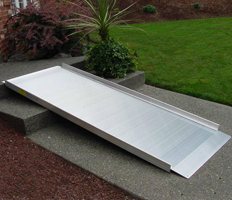 Rubber and aluminum are the most common materials used in portable ramps. Aluminum is lightweight and doesn’t corrode, making this material a good choice for portable wheelchair ramps. Surface: For safety purposes, you should always select a wheelchair ramp with a non-skid surface to prevent slipping, especially during inclement weather. Weight of Wheelchair Ramp: Wheelchair ramps will have varied weights, depending on the material used and the size of the ramp. Be sure to check that the weight of the ramp is reasonable for your needs if the ramp will be moved frequently. Weight Capacity of Wheelchair Ramp: Before selecting a wheelchair ramp, make sure to look at the stated weight capacity for the ramp you are considering. The weight of the chair, the weight of the user as well as the weight of the caregiver added together should not exceed the ramp’s total weight capacity. Portability: If the wheelchair/scooter ramp will be used in multiple locations, consider whether or not you need a ramp that can fold, and whether or not it has a carrying handle. Also make sure you know the folded size of the ramp to ensure that the ramp can be transported or stored appropriately. Wheelchair Ramp Width: Measure the width of your scooter or wheelchair, and be sure to select a wheelchair ramp width that will support that width with some room to spare. Wheelchair Ramp Length and Incline: One of the most important factors to consider when selecting a wheelchair or scooter ramp is the length of the ramp needed, which will depend on the incline angle you want to achieve with the ramp in place. The rise is the vertical distance between the ground and where the top of the ramp is going to sit. This distance is important to understand to ensure you select the correct wheelchair ramp length as explained below. The length of the wheelchair ramp is the total distance between the each end of the ramp. The rise in combination with the length of the ramp will determine the resulting incline angle of the ramp. Typically, every power wheelchair or scooter has a maximum allowable incline angle. Make sure to select a ramp that doesn’t have an angle greater than the maximum allowable incline for your chair. This is typically six to nine degrees for a chair that has someone sitting in it. The number of inches in the rise of the location for the wheelchair ramp will dictate the recommended length of the ramp to result in a safe incline angle. For manual wheelchairs, the general recommendation from manufacturers is to have 1 foot of ramp length for every 2 inches of rise. So if the rise is 8 inches, the recommended ramp length would be 4 feet. The ADA recommends 1 foot of ramp length for every 1 inch of rise which results in a smaller incline angle. Ramps with an incline of 14.5 degrees (or 1 foot of ramp length for every 4 inches of rise) should only be used for moving unoccupied wheelchairs and scooters. See the table below for resulting incline angles depending on several different rise and ramp length combinations (incline chart courtesy of EZ-Access). Ramp Transition: Look for wheelchair ramps that are designed to have a smooth transition where the wheelchair meets the beginning of the ramp. 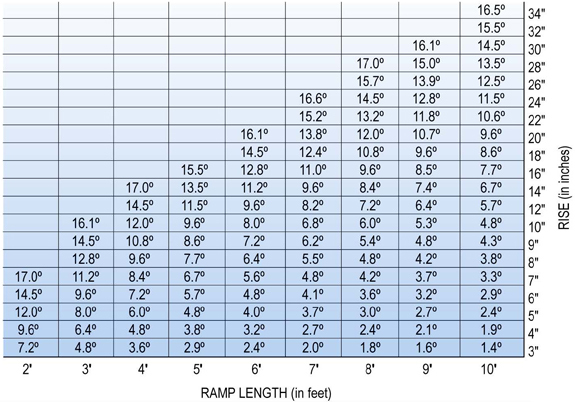 On our wheelchair ramp product pages, you will typically see a specifications table that outlines many of these critical factors for consideration which will provide valuable information to ensure you select the right wheelchair ramp. Be sure to review these tables carefully before making a purchase. Below is an example specifications table for our EZ Access® Transitions™ Modular Wheelchair or Scooter Entry Ramp. Make sure the top of the ramp is secured in position before using the ramp. Some ramps come with security pins which can be used to anchor the top of the ramp to the landing surface. You should always follow manufacturer recommendations and instructions. Make sure to use your lap belt while traversing a ramp in your wheelchair or scooter. This information is provided as a courtesy only. EnableYourLife.com (aka Enable Your Life, Inc.), or any of its vendors, assume no liability for any damage to property, injury, loss of equipment use, or any other malady that may befall an individual based on a wheelchair ramp selection and installation. If you are not sure of your ability to select the appropriate wheelchair ramp, EnableYourLife.com strongly encourages you to seek professional assistance.